Traveling from Portland, OR to Australia with a connection in LAX. Domestic Flight on Alaska Airlines to LAX with an International Flight (on seperate itinerary) on Qantas. Arrive in terminal 6 at LAX. Can checked baggage go from PDX to Australia without being rechecked in LAX? Do I have to go through security again in LAX? Alaskan is a little different to most airlines in this respect in that they WILL allow you to check your bags all the way through, despite the second flight being on a different airline and a different ticket. At check-in you will need to show them the details of your connecting itinerary (have a printout of it!). When you arrive in LAX you will be able to make your way directly to the International Terminal (aka TBIT or Terminal B) via a series of tunnels without exiting security, which means that you will be not need to re-clear security. This is a relatively well sign-posted route - you can find a photo of a map of it that I took here. When you get to the International Terminal you will need to go to the Qantas transfer desk to get your boarding pass - at which point you need to show them the baggage tag that Alaska Airlines gave you for your checked bags. If you do not do this it is possible you bag will not be loaded onto the plane to Australia. Although it's not relevant to your case, for completeness, if they were on an airline other than Alaskan Airlines (and still a on separate ticket) then you would NOT have been able to check your bags all the way through, and you would have had to exit security at LAX in order to collect them, walk land-side to the international terminal, and then re-clear security there after checking in at the Qantas check-in counter. By booking separate tickets, you are taking on a number of risks, most importantly that it there is a problem with your PDX-LAX flight and you miss boarding for your Qantas flight, you are a no-show and Qantas has no legal obligations to honor your ticket or rebook you, although they may put you on standby on another flight as a customer service gesture. In the event that you are not able to interline your bags, you will need sufficient time between the flights to reclaim your bags, transfer terminals, re-check your bags, and clear TSA security. I would allot four hours for peace of mind. In general, U.S. airlines are much less willing to interline now than they were even five years ago. Alaska will still do this with partners, of which Qantas may be counted, but you will need an agent who is willing and able to do it on separate tickets. Check in for both flights before you leave home. Go to the counter at PDX early, with a printout of your Qantas itinerary. If it is not too busy and you get an amenable agent, you may be able to get your bags checked through to the final destination, which would be ideal. If your bags are interlined to Australia, then your experience at LAX will be very straihtforward. 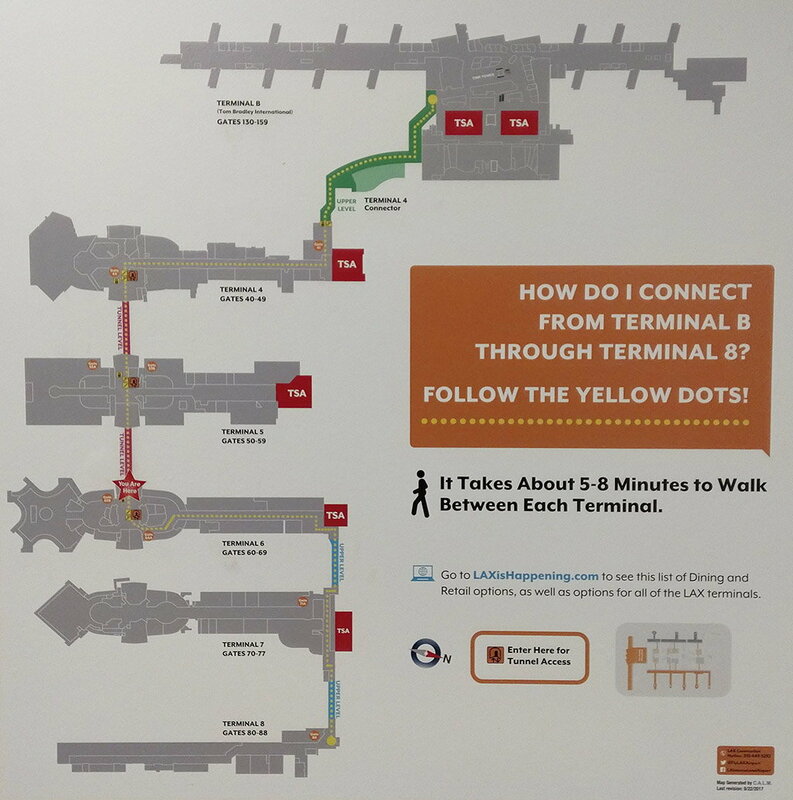 You will most likely arrive at Terminal 6. Your bags will be transferred automatically by the airline, and you will not need to pay any additional fees. You can then take the airside underground passageway from T6 to T4, then take the pedestrian walkway to the Tom Bradley International Terminal, where Qantas flights depart from. You will not need to re-clear security. While there is a shuttle bus, it goes counterclockwise around the terminals, which is the opposite direction you need to go, and is subject to epic traffic jams going through the airport loop. If Alaska will not interline your bags to Qantas things will be more complicated. After you arrive at Terminal 6, you will need to exit the secure area and collect your bags at the baggage claim area. You can then walk on the arrivals level from Terminal 6 back to TBIT. You will need to check the bags with Qantas; their counters are in Aisle B. If any Qantas baggage fees apply, you will pay them at this time. You must then re-clear TSA security at TBIT to get to your departure gate. Not the answer you're looking for? Browse other questions tagged layovers airport-security lax alaska-airlines or ask your own question.